What Markets Can I Spread Bet on? The Advantages of Spread Betting? The Risks of Spread Betting? Spread betting is a tax free* cost effective alternative to traditional trading. It allows you to speculate on the movement of stocks, shares and other assets without using a stockbroker or market maker, which means that you do not have to pay the normal commissions or fees. We make a 'spread' around a live, underlying market price, e.g. the actual price of gold, and you can bet on whether this market will rise or fall. This means that you can make a profit from both rising and falling markets, however, if the market doesn't move as planned then you can lose money. Spread betting, CFDs and margined forex trading are leveraged products which carry a high level of risk to your capital. Please ensure spread betting, CFDs and margined forex meet your investment objectives and, if necessary, seek independent advice. Click here to see the full risk warning notice. 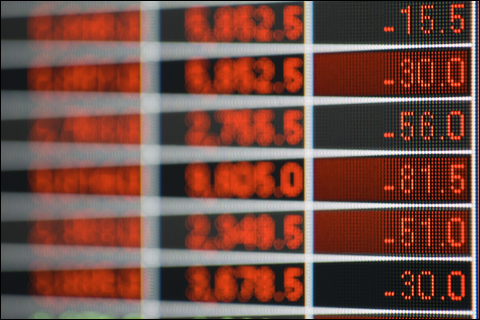 Spread betting can be an efficient investment option for trading the financial markets. Not only is it very versatile, allowing you to either go long (buy) or short (sell) a market, it can also help to reduce your trading costs because you do not pay traditional stock broker commissions. In fact, if you are a UK resident, then your profits are tax free*. You can also use spread betting as a hedging tool, i.e. to protect investments in an existing portfolio. You are not restricted to share trading, you can trade stock market indices like the UK 100, US SPX 500, Germany 30 etc. You can also spread bet on a wide range of other financial markets like crude oil, gold and forex markets like EUR/USD, GBP/USD etc. 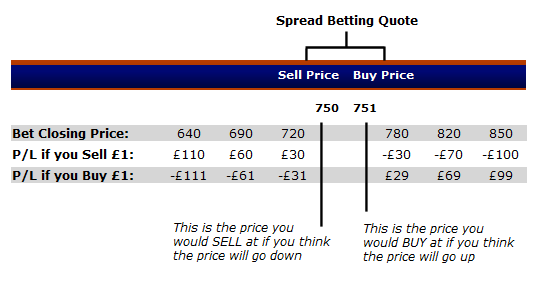 The "spread" in the phrase 'spread betting' refers to the Sell (Bid) and Buy (Offer) price quoted by a spread betting company. This price is calculated around the live (or the estimated future) market price of a financial product. For example, if the FTSE 100 is currently trading at 6229 then our quote for the UK 100 might be 6228.5-6229.2, i.e. a 0.7 point 'spread'. The Sell (Bid) price is the price you would sell at if you thought the market would go down. Conversely, the Buy (Offer) price is the price you would buy at if you felt that the market would go up. When you spread bet, you do not literally buy (or sell) the underlying asset itself but instead you make a bet as to which way you think the market will move. To illustrate, if you were spread betting on Facebook, you could speculate on the share price to go up or down but would not own any Facebook shares. Similarly, if you were spread betting on a forex pair like GBP/USD, you would not own either currency, you would simply be speculating on the forex market to rise or fall. When spread betting, you bet how much a market will move 'per point'. The amount you wish to bet is known as the "stake", and can be as little as £1, €1 or $1 per point of the movement of the market. The size of a 'point' varies depending on the asset but, for example, with UK shares 1 point = 1 penny of the share price, e.g. you might spread bet on the Barclays bank share price with a stake of £2 for each penny that the share price moves up or down. 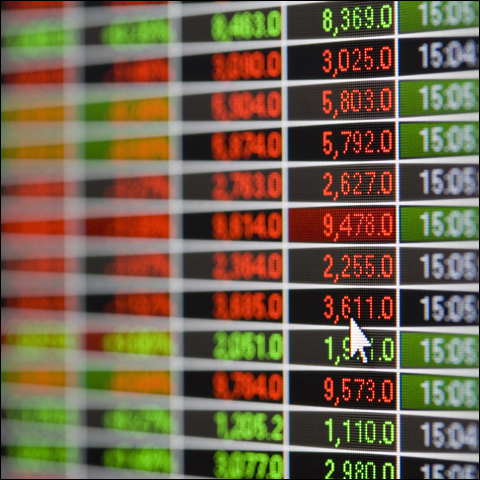 What are the Benefits of Spread Betting? Tight Spreads - at Financial Spreads we want to provide value for money and top quality service. You'll find that our spread quotes are very competitive amongst other spread betting companies. In some cases, you will find that our spreads are extremely competitive in relation to the live, underlying market quotes. 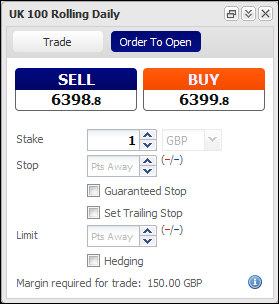 For example, during market hours our UK 100 rolling cash market has a spread of just 0.8 points, whilst the spread on our EUR/USD rolling spot market is just 0.7 points. 24 Hour Trading - we offer out of hours trading on a number of popular markets throughout the night from Sunday evening until Friday evening. 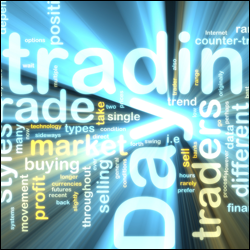 Trading Tools - many investors use technical analysis to guide their investment decisions. 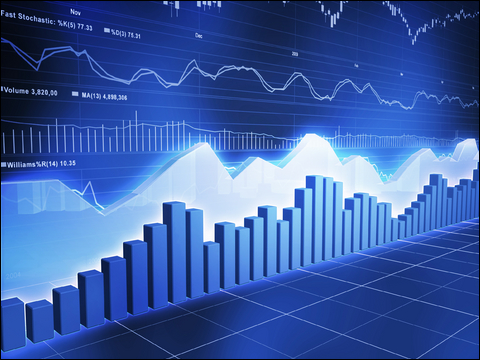 We provide live spread betting charts for every market to help you with your technical analysis. Hedging an Existing Portfolio - many investors use spread betting as an additional tool to hedge their existing portfolio. For example, if you have some shares which look like they will decrease in value in the short-term, you could short the value of these shares using a spread bet and therefore possibly make a profit to counter-balance the decreasing value of your shares. Ease of Understanding - it is often easier to understand spread betting than other forms of financial trading. Although you can make substantial profits from spread betting, if the markets move against your bet, your losses can also be substantial. Spread betting, CFDs and margined forex trading are leveraged products which carry a high level of risk to your capital. You should ensure spread betting, CFDs and margined forex meet your investment objectives and, if necessary, seek independent advice. Click here to see the full risk warning notice. Note that you can use Stop orders and Guaranteed Stop orders to help reduce your downside. With our standard FinancialSpreads+ accounts, Stop orders are automatically added to each trade. With Financial Spreads MT4 accounts, Stop orders are not automatically added to each trade however, we recommend that you add a Stop order manually. With any account, if a Stop order is triggered it is subject to market gaps unless you specified for your Stop order to be guaranteed. How Do I Calculate My Profit/Loss? Once you have chosen the market you want to trade, you can then bet with a stake of your choice, which will represent your profit or loss per point of movement of that market. Note that each market has its own individual maximum/minimum allowable stake. You can choose to bet that the market will rise, likewise, you can bet that it will fall. If you are right, you will make a profit of your stake multiplied by each point that the market moves in your favour. If you are wrong then you will make a loss of your stake multiplied by each point that the market moves against you. For this reason, you must be aware that your losses can increase dramatically if the markets move substantially in the opposite direction to your bet, e.g. if you 'Buy' the UK 100 (bet that it will rise) and the index moved sharply lower. Here is a guide to how it works. This is a Rolling Daily spread bet which means that there is no expiry date. If you don't close your trade and the trading session ends then your position will automatically roll over into the next trading day. Note that if a trade rolls over then you will normally either be charged or receive a small fee for overnight financing based upon whether you are speculating on the market to fall or rise. For more information also see Rolling Spread Betting. Points (Units) Traded Spread bets on the UK 100 market are made in £x per point. E.g. if the UK 100 changes by 30 points then you would win / lose 30 multiples of your stake. Stake Size You decide how much you want to trade per point, e.g. £1 per point, £4 per point, £20 per point etc. Brief Staking Exercise If you decided on a stake of £3 per point and the UK 100 moves by 24 points, you would lose/win £3 per point x 24 points = £72. Lock in a Profit? At this point, you may opt to let your spread bet run or close it, i.e. close your trade for a profit. In this example you choose to close your position. To close your trade you simply place a bet in the opposite direction (with the same stake size). So to close this £2 buy trade you place a £2 sell trade. The reality is slightly less confusing because when you are logged in, you can simply click the 'Close' button. Limit Your Loss? You may decide to keep your trade open or close it, i.e. close your trade to limit your losses. In this case you decide to close your trade by selling the market at 6218.8. Time to Take a Profit? You can choose to let your spread bet run or close it and lock in your profit. In this example you choose to close your position by buying at 6222.9. Close and Limit the Loss? You can decide to let your trade run or close it, i.e. close your position to limit your losses. In this example you decide to close your trade and therefore buy the market at 6308.1. One of the problems for spread betting companies is the word 'betting' as it can often provide a false impression to the marketplace. Spread betting is in fact a highly adaptable trading tool. 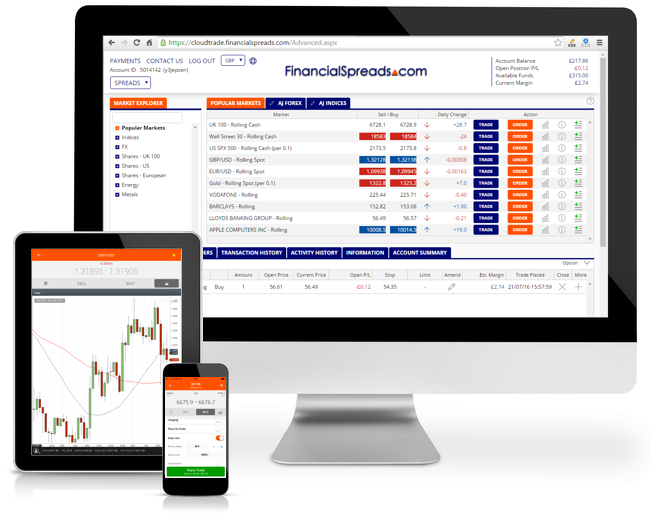 If you are new to spread betting, we highly recommend that you try our free Demo Account. 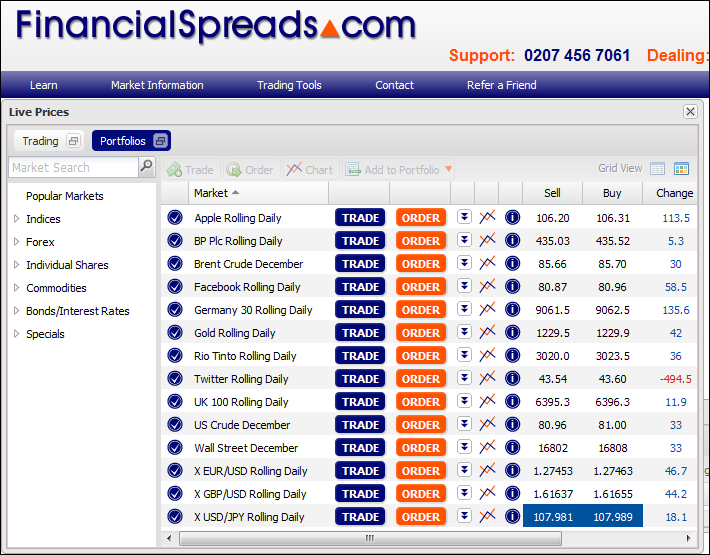 Financial Spreads offers a simple, user friendly platform. When you log in, browsing our range of markets and prices is quick and easy. We offer real-time spread betting and CFD charts on all of our markets and they come with a host of useful functions to help your analysis. Once you have completed your research, select the market of your choice by clicking on the 'Trade' button. A trading 'ticket' will pop up and show the live Sell/Buy price. This prices will change in real-time as the market fluctuates. You then update the 'Stake' field to your desired trade size and can customise the other aspects of your position. If you wish to buy, click on the 'Buy' button, or you can sell by clicking the 'Sell' button. Once your trade has been accepted, an online confirmation will appear on your screen detailing all of the information concerning your trade (the market, the price, stake, trade reference and stop loss level). You can also check the details of the trade via the 'Open Positions' tab. To Close or Amend your open positions, you simply look at the 'Open Positions' tab of your 'Trading Activity' window. This shows your currently open positions and the options available. 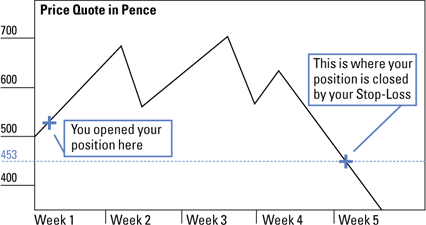 You can use Stop Loss orders to help reduce your downside. A Stop Loss is a trading order which tells our system where to stop and close your trade if the market moves against you. Stop Losses are used by investors to limit the potential downside of a trade. This is because the leveraged nature of spread betting can create large losses if the market doesn't move as you hoped. One of the great things about a Stop Loss is that it does not limit your potential upside. With FinancialSpreads+ accounts, Stop orders are automatically added to each trade. With FinancialSpreadsMT4 accounts, Stop orders are not automatically added to each trade however, we recommend that you add a Stop order manually. If the market gaps from one price to another, and doesn't trade at the level of your Stop Loss, your Stop order will be activated at the next traded price. We do offer 'Guaranteed Stop Losses' for a small fee - see below. Importantly, all Stop orders are on an 'our quote' basis, which means that your position will be closed at the Financial Spreads price that's quoted and not the live market price level. Let's say our Royal Mail market is currently trading at 499.0-503.0. If you believe that the share price will rise, you would "buy" at 503.0. You need to decide your stake; for this example, you choose a stake of £2 per penny movement. This means that you will make a profit of £2 for every penny that the share price rises and you lose £2 for every penny that the share price falls. Now that the trade is made, if you have the standard FinancialSpreads+ account, our platform considers the market type, the price and the funds in your account and automatically adds a Stop Loss level at, let's say, 453.0. So, if the market falls to 453.0, then your trade will automatically close to prevent further losses. If the Financial Spreads quote for Royal Mail rose then you may decide you want to close your position to realise the profit. However, if you left the trade running and the share price started to slide then it may fall down to 395.0 - 399.0. Potential Loss without a Stop Loss: (Closing Price - Opening Price) x Stake = (395.0 - 503.0) x £2 per penny = -£216. Actual Loss with Stop Loss: (Closing Price - Opening Price) x Stake = (453.0 - 503.0) x £2 per penny = -£100. Sometimes, normal Stop Loss orders can suffer from a problem known as 'Gapping' or 'Slippage'. This means that a market 'gaps' across, or 'slips' through, a Stop Loss level, i.e. the market spikes up or down and never trades at the level of the Stop. When that happens your Stop Loss will be activated at the next traded price and therefore your trade would be closed for a greater loss than expected. Although this is less likely in highly liquid markets, it's still a possibility when volatility moves the price around very quickly. Some markets are also more likely to gap over the weekend. As a result, Financial Spreads offers clients the option of using 'Guaranteed Stop Loss' orders. For a small fee, a Guaranteed Stop Loss will always close at the desired price, regardless of market gaps. As such, a Guaranteed Stop Loss puts an absolute limit on the potential losses of a trade. Again, it does not limit your upside. For more information, see our guide to Guaranteed Stop Loss orders.